The Spring meeting of the Adirondack Botanical Society will be Saturday April 20th from 10 am – Noon at The Nature Conservancy office in Keene Valley. For more details, email AdkBotanicalSociety(at)gmail.com or join our Google Group. To join the Google discussion group for the Adirondack Botanical Society send an email to adkbotsoc+subscribe(at)googlegroups.com. Write Join in the subject line. You can state why you would like to join in the body of the email. The ABS 2013 Field Trip schedule will be posted soon – but in the mean time – we thought we would share the NY Flora field trip schedule here as well. The first trip of the season will be Sunday May 5th at Nelson Swamp. This trip will also be the Annual Meeting. Trip details: 10 am – 3 pm. Rain or shine. 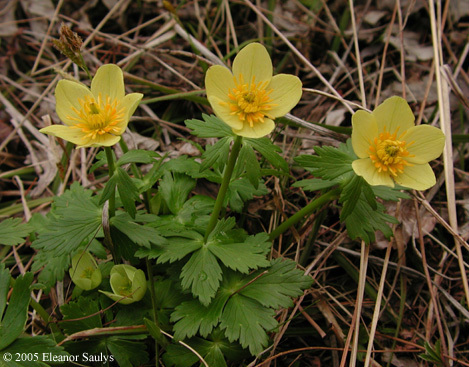 We will meet near Nelson Swamp in Madison County and explore this beautiful white cedar swamp with Sara Scanga, assistant professor of biology at Utica College, and learn about her research on the rare spreading globeflower, Trollius laxus. After the field trip we will meet at Ed Frantz’s house in nearby Cazenovia for a delicious lunch, a business meeting, and some fun botanical challenges. Join us for a day of learning, lunch and leisure. To register for the event so we know how many to plan for and for field trip details, email Steve Young – nisky912 [at]gmail.com or call him at 518-588-8360. A list of the rest of the field trips for the season can be downloaded here or you can find out more on the NY Flora Association’s website.